The simple and very tedious job of planking the funnels. As you can see, I haven't finished. I'm just doing to a few now and again when I feel like it. 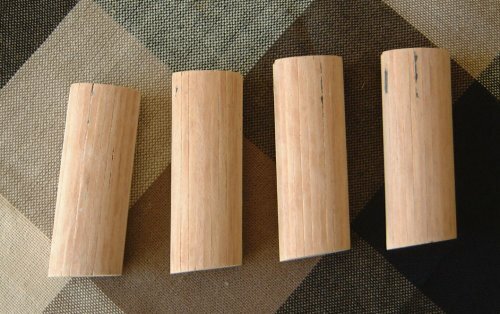 Don't forget to chamfer the planks slightly so you get a smaller gap between the planks. 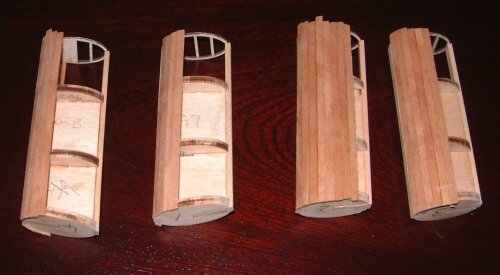 Here you can see I've finished planking the funnels, and they are waiting for some filler. You can see where some of the black paint bled through the planking. Some worry about this - the filler will fill the tiny gap so it won't cause any problems later.